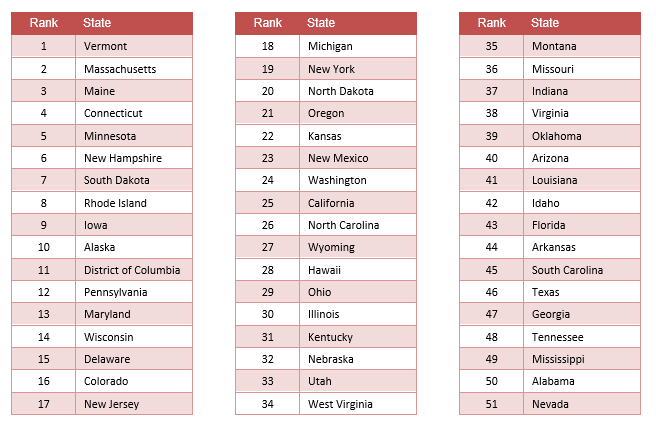 State and local level policies have the biggest impact on access to mental health care. Changes in these rankings may reflect policy changes that support constituencies who suffer from mental health problems. For example, states who passed laws supporting implementation of mental health parity laws and the Affordable Care Act show improvements in access to insurance rates. 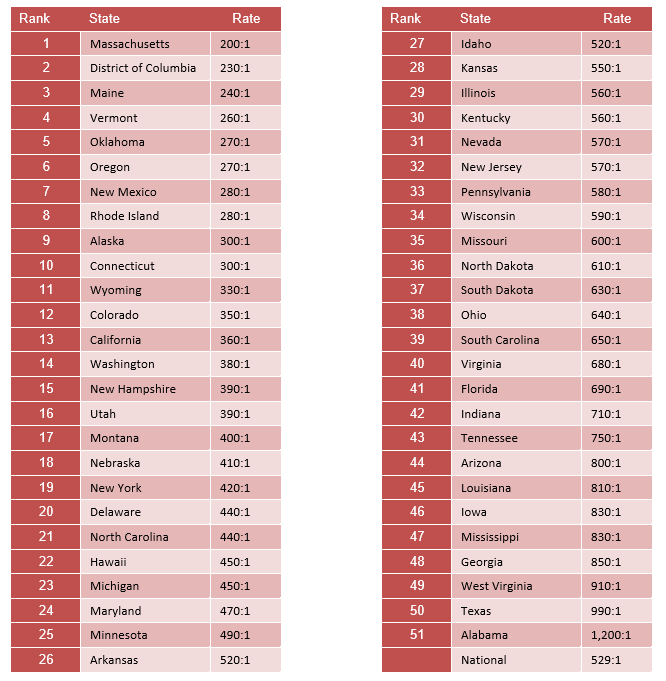 Those states that took aggressive policy changes, such as the implementation of The Mental Health Services Act in California, resulted in significant changes in access to care. 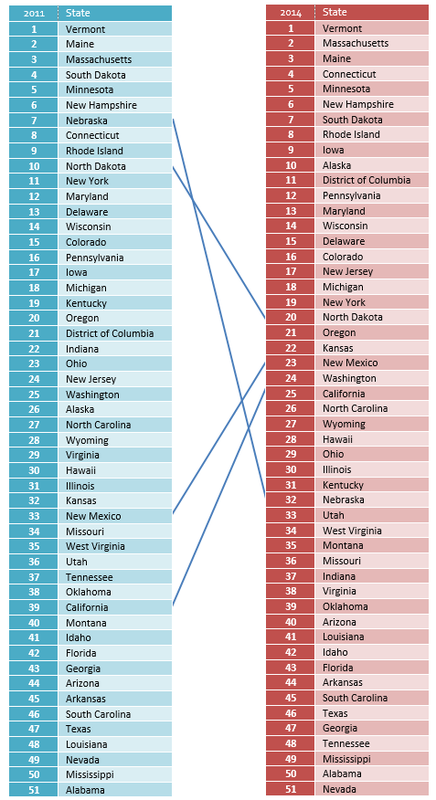 The connecting lines point to several changes among those states that have significant movement in ranking. A lack of movement at the top could indicate long term commitment towards better mental health policies. While lack of movement at the bottom indicates continued neglect of the mental health needs of constituencies. 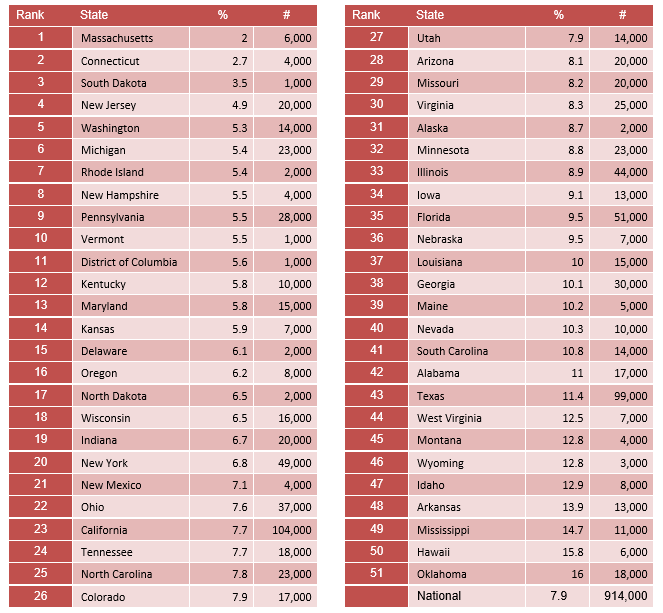 States can compare policies among other better preforming states of equivalent size, geography, culture, or political affiliation to identify potential policy changes to improve their numbers and rankings. 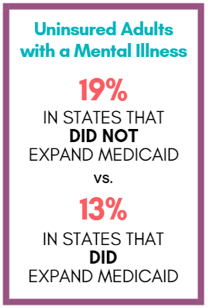 17% (over 7.5 million) of adults with a mental illness remain uninsured. With a national focus on health care access, the uninsured rate is improving. In 2011, 19% of adults with a mental illness were uninsured. 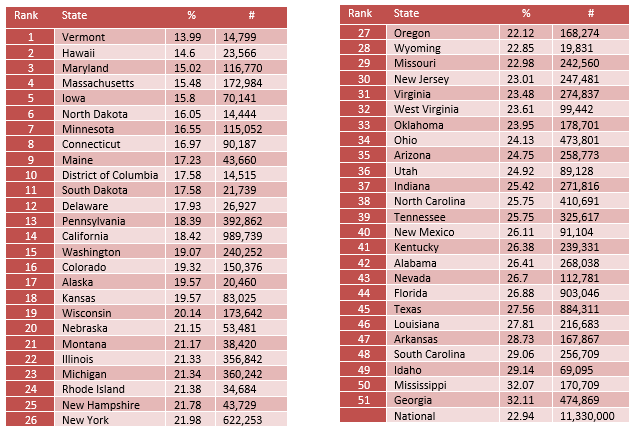 Alabama, Louisiana, Oklahoma, and New Mexico had the largest increase in access to mental health coverage among adults. Unfortunately, having insurance coverage does not mean access needed treatment. 56.5% of adults with mental illness received no past year treatment, and for those seeking treatment, 20.3% continue to report unmet treatment needs. 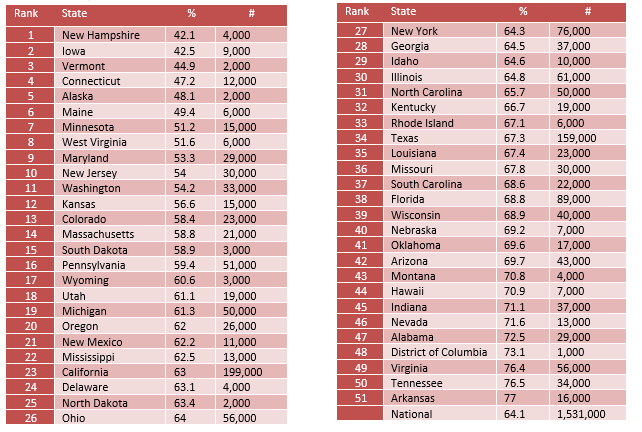 The state prevalence of uninsured adults with mental illness ranges from 2.7% in Massachusetts to 28.2% in Nevada. 56.5% of adults with a mental illness received no treatment. Lack of access to treatment is slowly improving. In 2011, 59% of adults with a mental health problem did not receive any mental health treatment. Reasons for not receiving treatment can be individual or systemic. Providing people with accessible and easy screening tools or encouraging primary care physicians to screen and ask about mental health problems are necessary in reducing untreated mental illness. 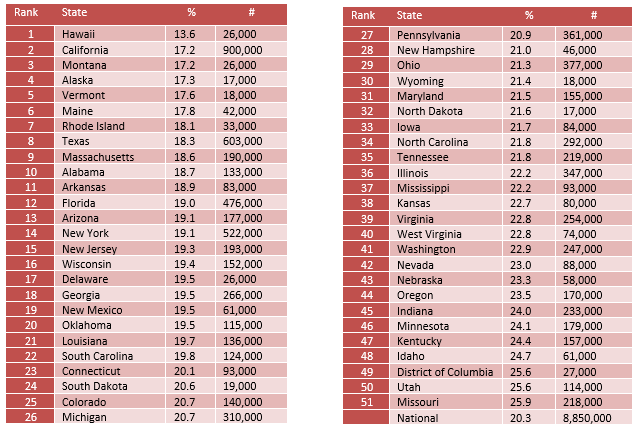 The state prevalence of untreated adults with mental illness ranges from 43.1% in Vermont to 67.5% in Nevada. One out of five (20.3%) adults with a mental illness report they are not able to get the treatment they need. 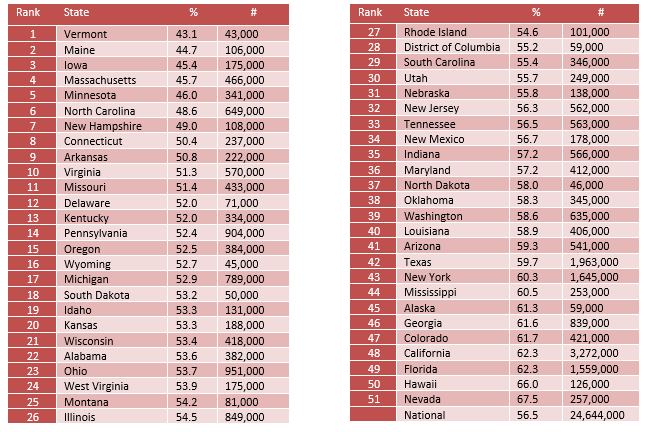 States with the highest levels of unmet need (bottom 10) are 1.6 times more likely to have people report unmet need. Unlike the number of people with mental illness who did not receive treatment, the individuals who are reporting unmet need are seeking treatment and facing barriers to getting the help they need. The state prevalence of adults with AMI reporting unmet treatment needs ranges from 13.6% in Hawaii to 25.9% in Missouri. 22.94% of adults with a disability were not able to see a doctor due to costs. The inability to pay for treatment, due to high treatment costs and/or inadequate insurance coverage remains a barrier for individuals despite being insured. 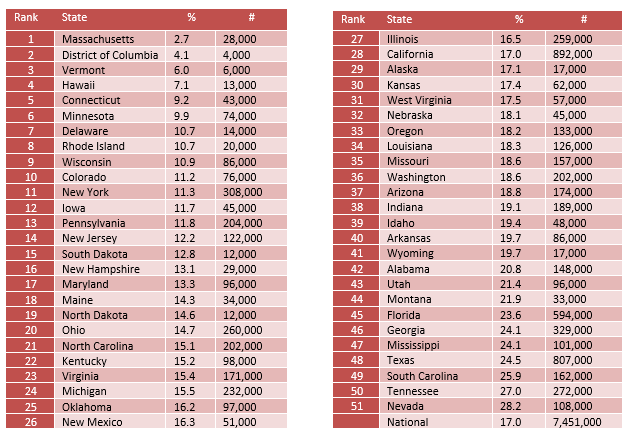 The prevalence of adults with disability who couldn’t see a MD due to cost ranges from 13.99% in Vermont to 32.11% in Georgia. 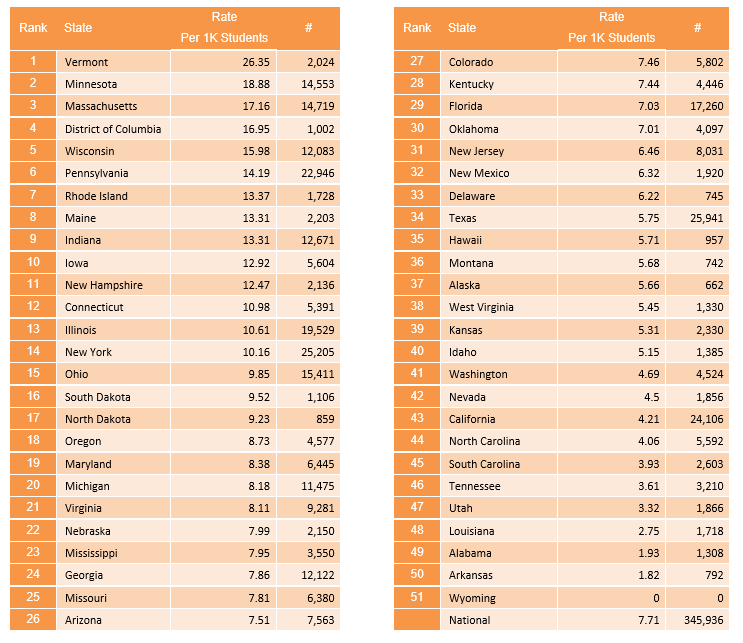 Nationally, there is one mental health provider for every 529 individuals. The term mental health provider includes: psychiatrists, psychologists, licensed clinical social workers, counselors, marriage and family therapists and advanced practice nurses specializing in mental health care. To make matters worse, the addition of low reimbursement rates combined with a limited number of providers and high demand for help means that many do not accept insurance, forcing families and individuals to pay high out-of-pocket fees or go without care. Peer support specialists, workforce development programs, telehealth, or primary care models like Collaborative Care are possible solutions to the significant mental health workforce gap in the states. 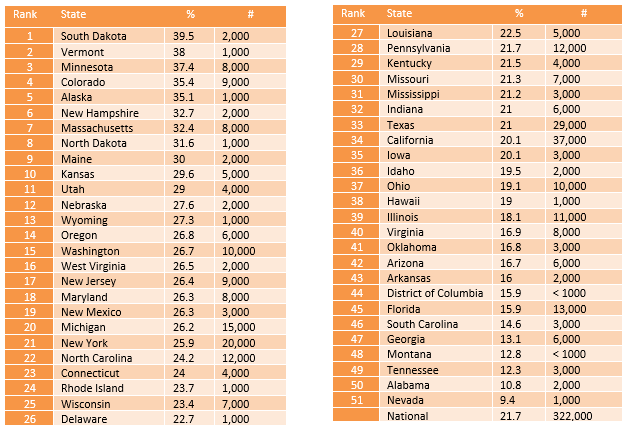 The state rate of mental health workforce ranges from 200:1 in Massachusetts to 1,200:1 in Alabama.